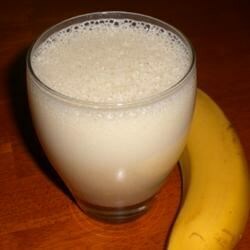 "A yummy banana smoothie that's great for breakfast." In a blender, combine banana, milk, egg, wheat germ, honey, vanilla and nutmeg. Blend until smooth. Pour into a chilled glass and serve. I'm not sure I enjoyed the nutmeg in this drink. Otherwise, it was flavorful and had a creamy texture. Thanks Marianne. I really liked this. I almost didn't put the nutmeg in, but it added a nice flavor. too much of an after taste from the nutmeg. THE BEST banana smoothie I've ever had! I eliminated the wheat germ (because i didn't have any) and it turned out fine. You have to try this if you love bananas. This was delicious! Best banana smoothie I have ever had!